SPRemember the HSA Blog post about the Blue Ridge Center for Chinese Medicine and the Appalachian Herb Growers Consortium? The organizations just received $200,000 from the Virginia Department of Housing and Community Development! SPThe Blue Ridge Center for Chinese Medicine – a nonprofit health care center overseeing The Appalachian Herb Growers Consortium – has been awarded $200,000 from a program run by the Virginia Department of Housing and Community Development. The grant, part of $4 million awarded from the Community Development Block Grant program, was announced by Gov. Terry McAuliffe’s office. SPFor more than two years, the Blue Ridge Center for Chinese Medicine has leveraged state grants to train and outfit growers as part of greater efforts to meet rising demand for herbs traditionally used to treat a variety of health complaints. SPLast year, the center reported that it signed up 50 growers, double from 2015. The center employs a certified Chinese medicine practitioner who can prescribe traditional medicines grown within a two-hour drive of the practice. Hopes for the future call for herbs produced by those same growers to be sold to practitioners across the mid-Atlantic. SPMedicinal herbs have been growing on the center’s grounds since 2006, but a consortium was formed in 2014 to provide education, plant testing and crop processing and sales infrastructure. SPA news release quoted McAuliffe saying that the projects receiving awards will help create new jobs and economic opportunities in their communities. SPHerbal medicines can cause kidney failure and liver damage in some consumers because they contain toxic chemicals or heavy metals, or react harmfully with other drugs, a study has found. SPThe finding comes from a paper published in the Medical Journal of Australia on Monday. Researchers led by the University of Adelaide reviewed the findings from 52 studies of herbal medicines and toxicology. SPThe lead author of the review, pathology professor Roger Byard, said the Therapeutic Goods Administration (TGA) should require independent testing of herbal medicines before placing them on the market, and that legal action should be considered when products did not comply with regulations. The products should also be closely monitored once on the market, he said. SPThe government is implementing the findings of an independent review of the regulation of medicines, including complementary and alternative products. Harsher penalties are set to be introduced for manufacturers who make misleading or false claims. SP“Toxic side effects of herbal medicines used in traditional societies have typically not been reported, and this is often cited in favour of their safety,” Byard said. SPThe predominant users of herbal medicines in Australia are women under 35 with a tertiary education. Many users of herbal medicines do not tell their doctor they are taking the substances because they believe they are natural and therefore, not harmful, a co-author of the paper, pharmacology lecturer Ian Musgrave, said. 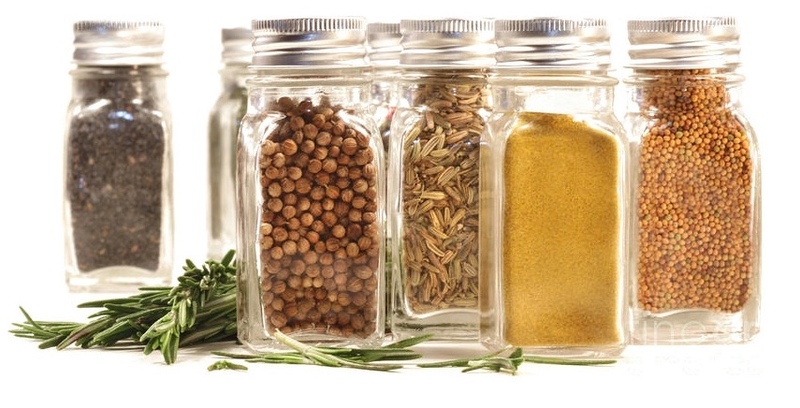 SP“But herbs can be a source of very potent toxins, and in fact many things we use as medicines derived from plants are toxic, poisoning predators,” he said. SPMusgrave said he was also concerned that people could buy herbal products from overseas, some of which had been found to have been illegally adulterated with pharmaceuticals to increase the effectiveness of the herbal product. SPA significant number of those products did not comply with Australian regulations and, in some cases, the ingredients were either not listed or their concentrations inaccurately reported. SPAnother study of traditional Chinese medicine products in Australia found excessive levels of lead, cadmium and arsenic in 61% of preparations, the review found, levels high enough to cause acute poisoning. Some preparations had been found to contain pesticides or contaminants associated with poor storage. SPMany herbal products did not carry adequate warning labels about side effects and drug interactions, Musgrave said. There had been cases of Australians dying of liver failure following ingestion of herbal products, he said. SPPharmaceutical companies are required to list all side-effects and possible drug interactions on their products. SPThe authors of the research concluded that a lack of regulation and monitoring of herbal preparations in Australia and other countries meant that “their contribution to illness and death is unknown”. SPDr Ken Harvey, a medicinal drug policy expert with Medreach, said TGA data on complementary and alternative medicines from 2015-16 found even higher rates of quality problems. SP“The 2015-16 data shows an 80% non-compliance rate overall, primarily due to labelling, advertising and evidence problems,” Harvey said. “doomsday” time capsule at the North Pole. 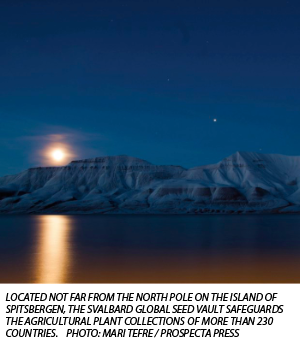 SPThe Svalbard Global Seed Vault is not exactly at the North Pole, but it’s nearer to it than just about anywhere else, and well inside the Arctic Circle on the Norwegian archipelago of Svalbard. This beguiling structure juts out from a mountain near the town of Longyearbyen, which is reputed to be the northernmost permanent settlement on Earth and a place where residents must go about their business with rifles slung over their backs, on account of the polar bears. The sun falls below the horizon on Nov. 14 and isn’t seen again until March 8. SPIt is precisely this remoteness and coldness that led scientist Cary Fowler and his colleagues at the Global Crop Diversity Trust, now known as the Crop Trust, to persuade the Norwegian government to locate the vault there. Almost nine years after it was built, the seed vault has taken on a mythic quality around the world, perhaps because its entrance — stark, geometric, bejeweled by a light sculpture by Norwegian artist Dyveke Sanne — hints at something not just hidden but forbidden. Bauhaus meets Valhalla. SPFowler, with principal photographer Mari Tefre, has just written a book on the vault that lifts the veil on the place — it’s not open to the public even though it quickly became the second most recognized structure in Norway. The book is called Seeds on Ice, and if you’re still looking for a gift for the gardener or gourmet in your life, this would work handsomely. SPSvalbard’s beguiling paradox of fame and mystery inevitably has spawned various wacky conspiracy theories, including the idea that the vault is a top-secret NATO facility housing a global eugenics project. Fowler hopes the book will dispel a more mainstream misapprehension, that this is a doomsday vault, a time capsule to unlock after a nuclear Armageddon. SPThe vault today houses more than half a billion seeds representing 881,473 unique varieties of plants used to feed people. The seeds come from the existing seed banks in 233 countries, and they are insurance against the loss of an irreplaceable crop to something as unexciting as a budget crisis in a poor country (or a rich one) to, yes, a cataclysmic nuclear war. SPEach seed has its own genetic makeup, and the value of these stocks is in their DNA. If a new disease or pest were to wipe out a strain of wheat, for example, it’s probable that the germ plasm at Svalbard could be used to breed in resistance. Climate change poses another tangible threat, as extreme weather events, rising waters and shifts in temperatures require the development of new varieties to handle the challenges. SPIn part, the Svalbard vault is best understood by what it is not: It is not a vast subterranean laboratory staffed with the world’s boffins in white coats, a la CERN or a James Bond movie. It is a hole in a mountain, a tunnel that extends a few hundred feet and terminates in three chambers, each 90 feet long, 30 feet wide and 16 feet high. Only one is in use at the moment. SPIt is simple, relatively cheap to run, and designed to withstand physical calamity and human interference. It is meant to last a thousand years or more. SPJim Richardson, provided by Prospecta PressCary Fowler in the main seed vault. Its natural year-round temperature is minus-5 degrees Celsius (23 degrees Fahrenheit), but the air is further cooled to the optimum storage temperature of minus-18 degrees Celsius (zero degrees F). housed behind at least five locked doors. You couldn’t just show up and loiter with intent. SPNor is it a time capsule. The seeds are alive and available for use today, if needed. SPUnfortunately, that has come to pass with the tragedy that has befallen Aleppo. The Syrian city held the seed bank of the International Center for Agricultural Research in the Dry Areas (ICARDA) and contained vital stocks of such staples as wheat, barley, chickpeas and fava beans. SPThe staff there sent seeds to Svalbard just months before the engulfing civil war. Last year, Svalbard returned many of the seeds to new ICARDA facilities established in Morocco and Lebanon, where scientists and farmers are now growing them to regenerate seed. SPThe threats to our food supply are often far less stark but no less real. Fowler says agriculture faces “its most severe set of challenges since the Neolithic period.” Besides climate change, this includes the need to grow more food for a growing population using fewer resources. One contemporary approach to this is the development of genetically modified organisms by multinational biotech companies. The vault doesn’t contain GMOs, though Fowler’s stance on this is not strictly in opposition to transgenic breeding. His interest, instead, is in conserving all the natural genetic diversity embodied in these seeds as insurance for our food supply in the centuries to come. SPIn the early ’90s, Fowler, a native Tennessean, was recruited by the U.N.’s Food and Agriculture Organization to oversee a review of the world’s crop diversity and found many national seed collections in dire states of storage and care. He has since left the directorship of the Global Crop Diversity Trust, though he remains an adviser to the trust and is chair of the seed vault’s International Advisory Council. SPHe says the Svalbard vault could bring a more rational system of seed conservation to seed banks around the world by relieving some of the pressure on national collections and the resources needed to maintain them. SPFowler has been immersed in this field for decades, but Svalbard made him realize, he said, that many of the world’s agricultural crops are not familiar even to experts. What, you might ask, is sesbania, or Chihuahuan snout-bean or voa vanga? SPLike the crystalline, fiber-optic sculpture at its portal, the vault is a beacon of optimism and comity in a world that may seem cold and dark. It is a gift to the entire human family for generations to come. Santa, an Arctic neighbor, no doubt would approve. John D. Sutter is a columnist for CNN Opinion who focuses on climate change and social justice. This story is part of CNN’s “Vanishing” series. Learn more about the sixth extinction and get involved. SPHe was an old man who spent his days alone in the mountains of southern Oregon looking for a bee. He hadn’t seen the bee — no one had seen this particular bee species — in 10 years when he asked me to join him. SPIt was August, the last breath of summer bee season. Robbin Thorp, then 82, a retired entomologist from University of California-Davis, wore a safari hat, tinted bifocals and a T-shirt with an image of Franklin’s bumblebee printed on the chest. That black-and-yellow bee, which looks like so many others except for the characteristic “U” on its back, is the object of Thorp’s obsession. It’s a creature he told me flies through his dreams, always just out of reach. SPFinding it — believing it can be found — is what brings him to this spot 6,400 feet above sea level, near the base of a ski lift, even though his gait is wobbly now and these craggy, alpine ravines could break a 80-something hip. SPFranklin’s bumblebee is a species other scientists fear extinct. But Thorp will barely entertain that idea. SP“When things are rare, they’re really, really hard to find,” he told me. SPThorp can be matter of fact like that. SPHe does this on his own time and for no pay, usually alone. SPDay after day, year after year. SPIt’s almost like something out of Hemingway: The old man and the bee. 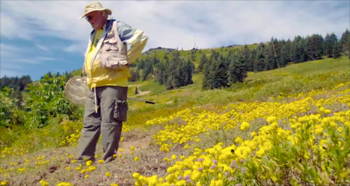 SPI’ll admit that when I met Thorp on August 8, 2016, the day before the 10-year anniversary of his last sighting of Franklin’s bumblebee, which occurred on that very slope, I had my doubts about his quest. To me, the bee hunt seemed like a Sisyphean task. That’s because scientists say we are entering a new age of mass extinction. Species are disappearing at something like 100 times the normal rate, and biologists fear three-quarters of all species could disappear in the next couple centuries if we don’t stop polluting the atmosphere and bulldozing habitat. SPIn that context, it’s hard not to see Thorp as an old man living in an old world, one where a species reasonably can be expected to survive one year to the next. SPWe don’t live in that world anymore. SPBut after two days with Thorp I realized that he’s on to something. SPIt’s precisely when we stop looking for species that we allow them to vanish. SPI’m sure by now you’ve read something about bees being in trouble. Maybe you’ve heard of “colony collapse disorder,” or perhaps there’s a do-gooder on your Facebook page who is raising a beehive in her yard and takes way too many selfies in a space-age suit. SPAll of that barely scratches the surface of the trouble bees face. SPThere are roughly 20,000 species of bees in the world — that’s more than birds or amphibians or reptiles or mammals — and the Western honey bee, the one you usually hear about, the one that lives in big, social hives and is domesticated to produce honey -- is just one of those species. SPTo get a sense of what the other 19,999 are like, it helps to talk to Sam Droege, a researcher at the US Geological Survey’s Bee Inventory and Monitoring Lab in Maryland. Droege spends his days taking super-high-resolution photos of dead bee specimens, some of which come from natural history museums and others that are pulled from field research. One benefit of the work is that it provides a detailed catalog of species, in case they disappear. SPBut the photos are also just really cool — in that way laymen can appreciate. Some of the images first got popular on a subpage of the website Reddit. SPWe’re losing this diversity fast. SPSo that’s the laymen's argument for why bees matter. SPHere’s the self-interested one: Bees help pollinate 35% of the world’s food, and bumblebees, of which Franklin’s bumblebee is (or was) one, pollinate everything from tomatoes to cranberries and blueberries and melons. Yet they live in underground colonies, caring for a queen. And they don’t make honey, so you don’t hear as much about them from journalists. SPSarina Jepsen, deputy chair of the International Union for Conservation of Nature’s bumblebee specialist group, and a director at the Xerces Society, an environmental nonprofit, told me about 25% of bumblebees in North America are at risk for extinction. “If you think about it, that’s a really strikingly high percentage of a fauna to be declining — and in some cases really crashing,” said Leif Richardson, a postdoctoral fellow at the Gund Institute for Ecological Economics. SPAnd much of the vanishing is undocumented. SP“It’s abysmal what we know right now,” Droege, from USGS, told me. SPRobbin Thorp started looking for Franklin’s bumblebee in the 1960s. He’d taken an entomology course at the University of Michigan and got hooked on the invisible insect world. It’s an obsession that was, from the start, both personal and professional. He told me his first wife did not love the fact that he kept stacks of insect eggs and other specimens in their apartment. SPIn 1998, he began to study Franklin’s bumblebee in earnest. SPIn part, he was interested in whether the bee should be listed under the Endangered Species Act. But he also just wanted to know what this bee was all about. Why did it live only in northern California and southern Oregon when so many other bee species had wider ranges? Which flowers did it prefer? Which plants and potentially crops would be lost without it? SPBack then, the bee was relatively abundant — not the most common, but far from the least. “I could walk down and see (Franklin’s bumblebee) on every patch of flowers,” he told me. SPA year or two later, the bee became more difficult to find. SPThorp’s work shifted from what-is-this-bee-up-to to where-the-hell-did-it-go. The bee scientist, in a sense, became a detective. Who or what could have killed Franklin’s bumblebee? SPThorp hoped finding it might offer some clues. Remember donating to HSAs Annual Fund is a great way to give and receive! Annual Fund Gifts provide support to The Society's annual programs and operation costs – and it's tax-deductible. It is a pool of unrestricted funds from individuals, corporations, and foundations that support the general operating budget. The annual fund campaign runs through the end of the calendar year, December 31. Many employers offer matching donations to non-profit organizations, check with your human resources department to see if your employer offers matching donations. How can individuals contribute to the Annual Fund? Individual donations currently represent over 30% of The Herb Society of America Annual Fund goal, making individuals vital and valued donors. All gifts to the Annual Fund, no matter the size, are deeply appreciated. Ask your employer about matching gift programs, to maximize the value of your contribution. The Annual Fund Campaign starts October 1, 2016 and runs through December 31, 2016, donations received during this time are considered to be part of the Annual Fund unless designated for another purpose by the donor. Additional donations are accepted at any time throughout the year. Donations are tax deductible within the United States. Donations are acknowledged with a letter from the headquarters office unless the donor chooses not to have an acknowledgement sent. For more information on individual support of the Annual Fund and how to ensure HSA continues to provide education opportunities for future generations, please contact the Executive Director at director@herbsociety.org or phone 440-256-0514. SPCelebrated on the Tuesday following Thanksgiving (in the U.S.) and the widely recognized shopping events Black Friday and Cyber Monday, #GivingTuesday (#GT) kicks off the charitable season, when many focus on their holiday and end-of-year giving. SPThe Herb Society of America is participating in #GivingTuesday on Tuesday, November 29, 2016. HSA is joining the movement and giving. HSA is asking members, friends, and families to join us as we give back and share this idea of giving. SPThe Herb Society of America is raising funds and awareness for The Samull Classroom Herb Garden Grant program. Donald Samull, was an elementary school educator who used herbs in his classroom to teach math, science, English, and social studies. Through a gift from his estate, The Herb Society of America established The Samull Classroom Herb Garden Grant. Annually, ten schools are awarded $200 in “seed” money to establish a garden at their school. 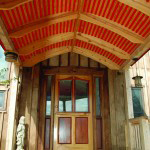 Collaboration, sustainability, and outcomes are encouraged in the grant applications. SPIn 2010, the first year of the Samull grant, three applications were received. Today, over two hundred applications were received from school in almost all of the fifty states. In six years, the Samull grant has been awarded to over forty schools. SPOn #GivingTuesday, we ask for your support of the teachers like Christine who are carrying on Mr. Samull’s inspiration and tradition with a donation to the Samull Classroom Herb Garden Grant. SPHSA asks that you join us in sharing #GT with your family and friends. 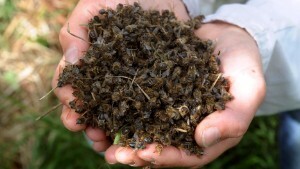 (CNN) The pictures are heartbreaking: Millions of honeybees lie dead after being sprayed with an insecticide targeting Zika-carrying mosquitoes. SP"On Saturday, it was total energy, millions of bees foraging, pollinating, making honey for winter," beekeeper Juanita Stanley said. "Today, it stinks of death. Maggots and other insects are feeding on the honey and the baby bees who are still in the hives. It's heartbreaking." SPStanley, co-owner of Flowertown Bee Farm and Supply in Summerville, South Carolina, said she lost 46 beehives – more than 3 million bees – in mere minutes after the spraying began Sunday morning. SPJuanita Stanley says she lost more than 3 million bees. SP"Those that didn't die immediately were poisoned trying to drag out the dead," Stanley said. "Now, I'm going to have to destroy my hives, the honey, all my equipment. It's all contaminated." SPStanley said Summerville Fire Capt. Andrew Macke, who keeps bees as a hobby, also lost thousands of bees. She said neither of them had protected their hives because they didn't know about the aerial spraying. SP"Andrew has two hives," Stanley said. "He didn't know they were going to spray. His wife called him. His bees are at their porch right by their home, and she saw dead bees everywhere." SPIt's a tragedy that could be repeated across the country as cases of Zika continue to rise and local mosquito control districts struggle to protect their residents and ease local fears. SPThe spray fell from the skies between 6:30 and 8:30 a.m. Sunday. It was the first aerial spraying in 14 years, according to Dorchester County Administrator Jason Ward, part of the county's efforts to combat Zika after four local residents were diagnosed with the virus. SP"We chose Sunday morning because few people would be out and about that early on a weekend," Ward said. "To protect the bees, you don't want to spray after the sun has been up more two hours, so we scheduled it early." SPThe county used a product called Trumpet, which contains the pesticide naled, recommended by the Environmental Protection Agency and the Centers for Disease Control and Prevention for control of adult Aedes aegypti, the mosquito that transmits Zika. SPAccording to the manufacturer's label, Trumpet is "highly toxic to bees exposed to direct treatment on blooming crops or weeds. To minimize hazard to bees, it is recommended that the product is not applied more than two hours after sunrise or two hours before sunset, limiting application to times when bees are least active." SP"We followed that recommendation," said Ward, "which is also the policy laid out by the state, using a pesticide the state has approved for use." SPWard says the county also notified residents of the spraying by posting a notice on its website at 9 a.m. Friday, two days before the spraying. He added that it alerted beekeepers who were on the local mosquito control registry by phone or email, a common practice before truck spraying. SPNeither Stanley or Macke were informed, Ward said, because they, like many hobby beekeepers, are not on the local mosquito control registry. SP"We are obviously saddened by the fact people have lost their hives, and we have gone back and looked at our procedures," Ward said. "We will now give up to five days of advance notice, and we have expanded our list to include more local beekeepers." SPStanley says she doesn't think there was malice involved, but that doesn't make the loss of her "honey girls" any less painful. SP"This wasn't about the honey," she said. "It was about raising bees and selling them to other people, and spreading the honey girls out there into the world. Now, I can't help anyone anymore, because all of them are dead." SPWell, we 'paid a visit to the pawpaw patch'. We met a lot of nice folks, talked to some pawpaw growers, and tasted a little sampling of pawpaw recipes at the annual North Carolina Pawpaw Festival in Winston-Salem. The event is sponsored and hosted by the NC Cooperative Extension Agency. 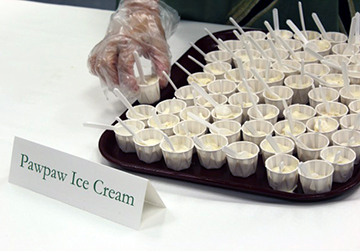 There are lectures, displays, cooking demonstrations, plant sales, books, a long table of sample tasties all made from pawpaws, and fruit for sale. SPThe creamy sweet fruit has a taste reminiscent of a cross between a mango and a banana. A collage of pawpaw aficionados converged to admire, celebrate, and learn about this smallish American fruit tree (Asiminia triloba), a staple food source dating back to the earliest inhabitants. The unique flavor of the ripe vaguely mango shaped fruit has been described as a cross between banana, mango, and a tang of citrus. Chances are you’ll never find pawpaws at your supermarket and rarely does it make appearances at the local veggie stands. It neither stores nor ships well, so you either grow your own, connect with someone who grows it, attend festivals like this one (though they sold out of fruit the first 1/2 hour), or buy the value-added products like purees, jams, chutneys and, yes, of course, beer! Pawpaw fruit does freeze well, so peel it, slice it, bag it and freeze it. Yes! Even delicious ice cream! 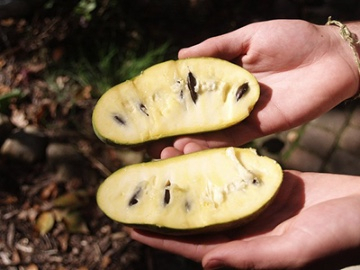 One of the best ways to get familiar with pawpaws, is by attending a festival dedicated to the cultivation and use of this remarkable fruit tree. We’ve scouted a few to check out either this year or next. And of course, the very best way is to enjoy America’s largest native fruit down yonder, in the pawpaw patch (if you’re lucky enough to find one). According to a recent study from Germany, researchers have isolated three new penicillin-like compounds with clinically relevant antibacterial activity – known as penialidins 1-3 – from the fungus Penicillium growing within the leaves of a medicinal plant from Cameroon. 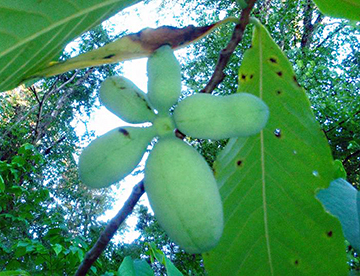 The plant, Garcinia nobilis (syn. Garcinia lucida) is related to the well known garcinias in commerce, mangosteen and Garcinia cambogia, common in weight loss products. G. lucidum bark is used in Camaroonian food and medicine. SPWhile many plants have antimicrobial properties, the effectiveness of G. nobilis appears to be due to naturally-present penicillin. Penicillium is the name for a family of fungi found everywhere in our surroundings. The Penicillium described in this study is an endophyte, which is typically a bacterium or fungus that lives inside a plant without causing apparent disease. In fact, many commercially important plants carry fungal endophytes which enhance their growth, improve their ability to tolerate drought and even boost their resistance to insects and mammals that eat them. Penicillin antibiotics were among the first drugs shown to be tremendously effective against many previously serious conditions, such as bacterial infections caused by staphylococcus and streptococcus. Many types of commercially available penicillins are still widely used today, although their overuse has made many species of bacteria resistant to them. In the present study, the structures of the three newly discovered penialidins were first determined using sophisticated analytical methods such as nuclear magnetic resonance spectroscopy (NMR) and high-resolution mass spectrometry (HRMS). Next, the antibacterial activities of these new compounds were tested on the clinically relevant species Staphylococcus aureus, Escherichia coli, Bacillus subtilis and others. Penialidin 3 was seen to be as effective against S. aureus and B. subtilis as the standard antibiotic streptomycin. Penialidin 2 was also very active against S. aureus. By comparing the structures of the three new penialidins, the study researchers were able to deduce structural changes that would significantly increase the antibacterial activity of penialidin 1. In conclusion, three new penicillin-like compounds isolated from the fungus Penicillium growing within the leaves of a medicinal plant from Cameroon show clinically relevant antibacterial potential. 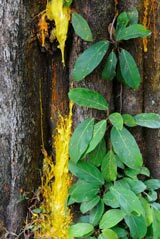 Technical Summary Three new polyketides named penialidins 1-3 were isolated from Penicillium harbored in the leaves of the Cameroonian medicinal plant Garcinia nobilis. Their antibacterial efficacies were tested against S. aureus and E. coli. Penialidin 3 exhibited pronounced activity against S. aureus as well as against B. subtilis similar to that of the standard antibiotic streptomycin. Penialidin 2 was also highly active against S. aureus. Comparison of the structures of the three compounds revealed that altering the substitutions at C-10 and C-2 can significantly increase the antibacterial activity of Penialidin 1. See the full article [LINK] for all the details.